This ShareASale affiliate is an affiliate program that has changed my mind. ShareASale is the great alternative to this almighty Adsense. ShareASale is an affiliate program from which we can promote almost all products of some good companies. The companies like Godaddy.com, Studiopress.com and many other branded companies. I am pretty sure that you are just thinking of making money with Adsense. Google Adsense does not approve the blog with low traffic. So, if you are new then just forget about Google Adsense. Just give a shot to ShareASale.com. Most of the people want to come in the blogging field to earn money. But let’s face it there is huge competition out there. So, you need to be passionate too. I have also started this affiliate marketing a few months back. Some bloggers are making handsome money for this. So, I also started this program. How can you make Money Blogging with ShareASale? It is a program in which you promote products that registered with ShareASale. It’s a two-way program which connects the merchants with the affiliate promoters. On each sale, you can get the percentage of sale made. Why I recommend the ShareASale? I have used many affiliate marketing programs like ClickBank, CJ and much more. ShareASale has a wide range of variety of products. Pay per sale and Pay per lead both options are there. You are paid according to the sale or lead. The response time of merchants is very less. It varies from 2-3 business days. Their help support is very good at solving problems. Great product quality in comparison to other networks. Who could join ShareASale Affiliate Program? Anyone can join this ShareASale affiliate program who have a medium to promote products. I have earlier mentioned that ShareASale has a wide range of products to choose from. So, whatever niche of blog you have. You can promote products. Home & Garden: Helix sleep, Hurom. 1. You have to go to the ShareASale website by clicking here. 2. You have to click on the Affiliate Sign Up. 3. If you want a fast approval than try to use your own domain name email address i.e(example(@)yourdomain.com. If you want you can also sign up with Gmail, Yahoo and Hotmail email address. You have to confirm that you own this website, to do that you have to click on the email i.e has been sent to your mail id. If you want to confirm, there are two methods. You can confirm as described earlier or you can paste a code given by ShareASale to the head section of your website. 1. The Dashboard of this affiliate program is very good and easy to access. 2. You have to fix the need attention column. You have to verify your email address and have to verify your website as I have signed up from Gmail Account. 3. ShareASale also supports direct transfer of your monthly balance to your bank account in some countries. If you live in a such a country that full fill their norms as per payment that you can enjoy this function. Your income will directly be added to your bank account when all the payments of the last month would be clear. Also Read: What are email solo ads? 4. ShareASale provides a bank form in which you have to fill the name, city name, IFSC code of the bank, and your account number. Now, ShareASale directly transfers money to your bank account. I am providing the form below. 5. The threshold income(minimum income) that you can transfer from ShareASale is 50$. 6. A ShareASale affiliate can check their income on daily basis. 7. The payment made by ShareASale is on 20th of every month. 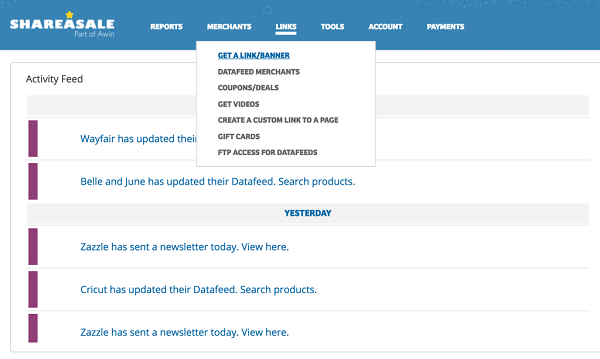 For the new publishers (ShareASale affiliates), we have a search for merchants options on the left-hand side of the merchant navigation menu. You can select affiliate products as per your niche. Just click on search on merchants and the page will direct you to a search for merchants window. 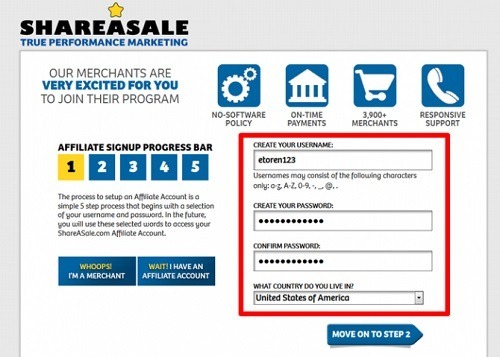 Just type in the of the ShareASale affiliate you want to promote and press search. After getting the products you want to promote, ask them to join the program. It’s all depends on upon your luck. Some affiliate is auto-approved but some approve manually. It’s all depends on upon your luck. Programs like StudioPress, WP engine (Special Offer – Buy for 1 year and get two months for free), and SEO power suite are premium programs, that are approved manually. ShareASale affiliate links are available to the links and banner section. You can use these links in your blog. You should promote a product that you have used earlier, as you can easily solve the problems of your buyers. Promote only products related to your niche. You should always try to promote products on to your blog. You can also promote on to your fan page and to the forums who allows affiliate marketing on their forums. Make a list of items, as I have written(Genesis Child Themes). I just say try to promote products that you have used earlier and that benefit you most in the affiliate marketing. The blogs with less traffic can also use ShareASale. Your audience is targeted. It is best to promote. Are you ready to make your first dollar online? Sign up for ShareASale Affiliate Program and start earning today. It looks like that Shar a Sale affiliate program is good enough. So, Ii will surely give it a try. I am great fan of Shareasale affiliate program. I am earning more than few thousand dollars just by promoting studiopress and SEOPowersuit. Thank you for sharing how an affiliate marketer or blogger can join and get accepted in shareasale affiliate program. I really appreciate your efforts and knowledge. Affiliate Marketing is one of the hottest online income sources. Many pro bloggers the primary income source from affiliate marketing only. I started an entire new affiliate blog on hostings and joined some hosting affiliate programs, through shareasale. ShareASale is a large network place to find the suitable high paying affiliate program on our blog. Nearly 3000+ companies are offering affiliate promotions. Till now i have not received any payment, my blog a month old, busy in writing articles. Once i get my first affiliate income through shareasale, will share the income proof in my blog. Thanks for the review mate! Thanks for sharing details of this Affiliate Ad Network, I am planning on Earning more revenue throgh Blog Monetization.It is a great help!